In this globalized social age, sending the wrong message in the wrong pipe at the wrong moment is the digital equivalent of spitting in the wind. Worse, investing resources and energy to craft high-grade content can be completely undone by careless social media planning. Unfortunately, no social media software of content planning tool can make up for erroneous thinking, That’s why we’ll call upon one of the greatest minds of our times to help us figure out how today’s social networks actually work. Only then will we see how we can boost your online engagement, multiply shares and likes with no other effort than smart planning with the right social media tools. This is a vast subject, so grab a fresh cup of joe and hang on tight while we undertake the journey that will take you from social media newbie to social marketing genius. You will learn why social media is a 4-dimensional spacetime, how this knowledge can dramatically boost engagement for all your social networks and how to schedule social messages for optimum impact. In a next installment, we will demonstrate SeoSamba can help you tie it all together to both streamline your social communications and help increase conversions for your business. But first, there are a few things that require your full attention and ultimate comprehension. When we assert that we need to think out of the box to boost social engagement, we mean it. And that’s exactly what Albert Einstein did when he came up in the 1920’s with his groundbreaking theory of relativity. Though we live and experience our environment as a 3-dimensional space rolling along a linear timeline, Einstein showed us the world as a unified space-time continuum. Behind the scientific mumbo-jumbo, Einstein meant that time and space cannot exist without each other. Even more importantly, he asserted that our perception of this 4-dimensional universe is not monolithic and linear, but entirely contextual and relative to the observer. That’s precisely what the great Edgar Allan Poe meant when he asserted that “space and duration are one” back in 1848, only no-one including himself really understood back then what it implied. From a practical standpoint, the main problem with Einstein’s theories is that the human mind is just not fit to visualize this complex 4D universe as it really is. Though we use at every second of our life, if only for movement coordination, the concept of space-time relativity is so disconnected from our conscious personal perspective that no matter how hard we try, we just cannot visualize it, even with the help of simplified representations. As acclaimed geographer David Harvey once wrote, “there is an omnipresent danger that our mental maps will not match current realities”. Unfortunately for nowaday’s internet marketers, rethinking our entire view of how things actually work despite everything we’ve ever known is exactly what is asked of us in order to achieve success. Up until recently, the internet was still essentially a space-constrained environment. You had to sit in front of your computer to post messages while your audience had to do the same to read it. In other words, internet marketing was the globalized equivalent of throwing the daily newspaper on people’s front porch and hope they pick it up to read it. Old-school internet marketing techniques are still bound by this 3D paradigm. From SEO to content marketing, the rule of the game is to create messages that users will pick up sometimes down the road, whether through search engines, an outbound link or a friend’s recommendation. But as opposed to websites or search listings, most social platforms - from Facebook timelines and Twitter feeds to Pinterest walls - are fundamentally time-driven, as forefront featured content changes from one minute to the next. In the social media universe, timing IS a crucial parameter, and in that respect some might even argue that the when overcomes the what, and content is actually less important that timing. Indeed, however likeable and shareable your content is, you can’t expect people to relay your message if they’re just not there to receive it. On Twitter, careful timing can multiply potential shareability ten-fold, with no extra effort than taking the time parameter into account. 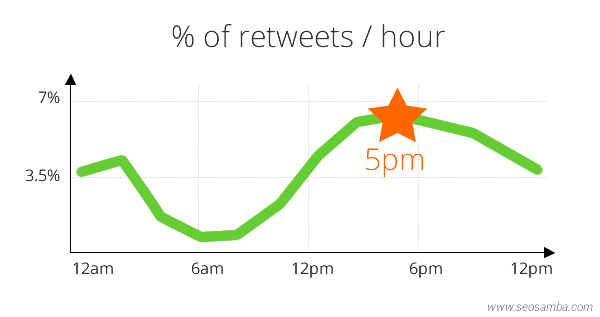 For instance, if your tweets appear on your audience’s timeline at 8am, you will get on average a single retweet, whereas the same tweet might get shared 6 times if received at 5pm. 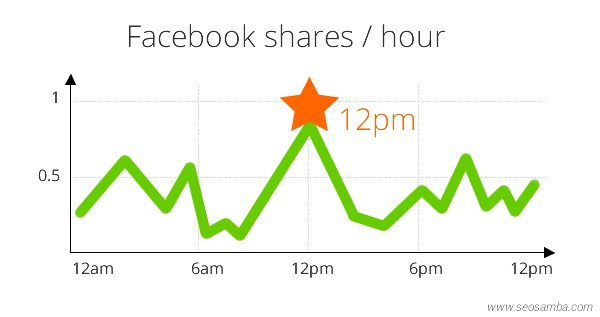 Similarly, Facebook posts are no less than five times more likely to be shared or liked around noon than later around 2pm. Though impressive at first glance, those numbers are just general averages that may not apply to your own reality, but they do show how crucial timing can be. The implication of these self-explanatory statistics are clear: by not paying attention to the time-related nature of social media, your social marketing strategies might require five times more work, energy, and resources. Considering your newfound enlightenment regarding the intricate 4-dimensional nature of social marketing, we now must put this precious knowledge to good use. Your first mission to become a time-driven social genius will be to check on traffic and social stats to find out when your target audience will be most receptive to your messages. As always, knowledge is power, so if you don’t have an extensive web analytics tool already in place on your website, now would be the time to get one. Forefront contenders in that area are Google Web Analytics and Piwik, both letting you access tons of useful numbers once you simply include a snippet code in all of your webpages. Once you have access to enough significant data, you can clearly determine at what times the most visitors check out your website, which happens to be the time they are most receptive to whatever you’d like to share with them. But as we have learned from Eintein, time is relative so make sure to identify your optimal social sharing time-window as ‘local time’ which is given by your visitors’ own clock, rather than ‘server time’ which might turn out deceptive at best, or altogether irrelevant especially if your servers are located far away from your visitors’ locations. 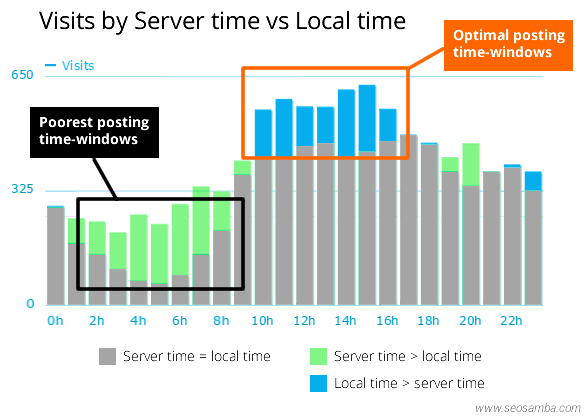 For instance, server time might lead you to think that you have a much larger time window that it actually is, and this can make a huge difference in terms of measurable results. 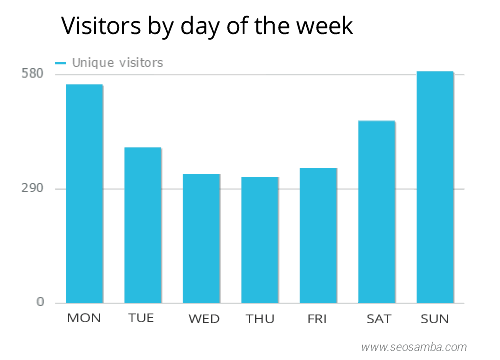 As you can see from the real-life example below, visits by server time show almost the same numbers around 9am and 4pm, but local visitors’ times show that there is actually 30% more traffic at 4pm than 9am. You also want to check data over the months. While there may not be a significant difference for certain businesses, stats for websites with seasonal activities will show huge differences from one month to another, and optimal times might change as well. 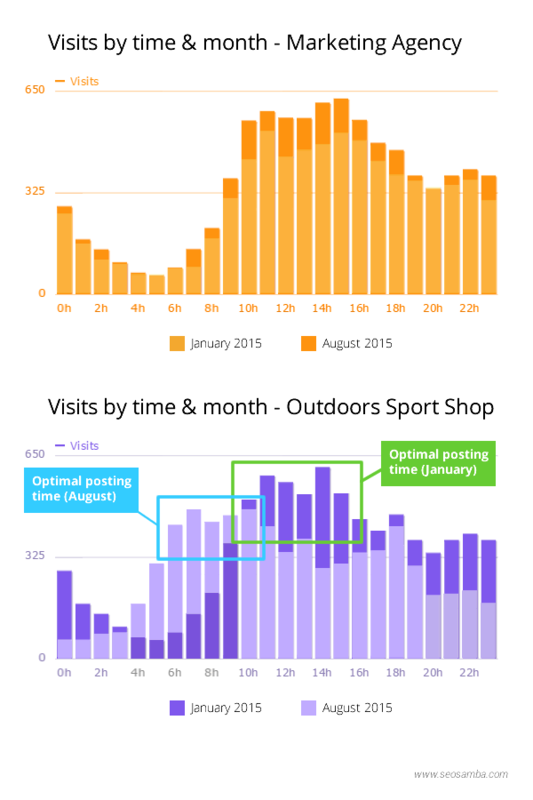 In the following graphic we can see that while an online marketing agency experiences little relative difference in optimal posting times 6 months apart, traffic is much less constant for an outdoor-sports online shop. This client of ours in the education business was taking care of social marketing all by himself, which was fine until he noticed that he had hit a glass ceiling in terms of traffic no matter how many messages he posted on social networks. More specifically, this business school organizes introductory meetings every Wednesday, which turns out to be their main way of converting potential candidates to bona-fide paying students. As it turns out, this client was posting simultaneous messages on Facebook, Twitter, Google+ and LinkedIn 24 hours beforehand as a reminder for students to attend the forthcoming meeting. When he asked us for help, we took a good look at his traffic and social stats, and quickly noticed that most candidates were doing their online research for their future school on weekends. Obviously, Tuesdays were already too late a date to leave them with enough time to check out the website, register online and actually make it to the meeting. We helped him craft a time-driven social campaign that would focus on the weekends with specific messages and plenty of information about the said meeting. He then would post a ‘last chance to register’ reminder on the following Monday to prompt them for action. As you’ve correctly guessed, this worked wonders for his business, and without investing an extra cent or even posting more messages, his time-focused social posts drove both traffic and attendance to the roof. Now that the school’s meeting-related social campaigns have reached what seems to be its maximum potential in terms of response, our client has moved on to focusing on lead acquisition during the slower days with more casual messages that outline the school’s strong points, as well as relaying current students’ posts found on his social network to build up brand recognition and trust amongst potential candidates. Once you’ve understood how timing can tremendously boost web traffic and conversion rates, you still have to do all the hard work. A few amongst major social networks - such as Facebook and Twitter - do have planning tools already in place so the first step to implement better social media planning is simply to start using them! But whereas most social media pros and community managers primarily use scheduling to “save time” or help them managing multiple accounts, you can use scheduling to boost overall engagement for your social messages by pushing them at the right time for the right audience. Though this feature only works for Pages (not personal timelines), Facebook scheduler has tremendous value as it lets you post messages at optimum times for a given country, state, region or city. 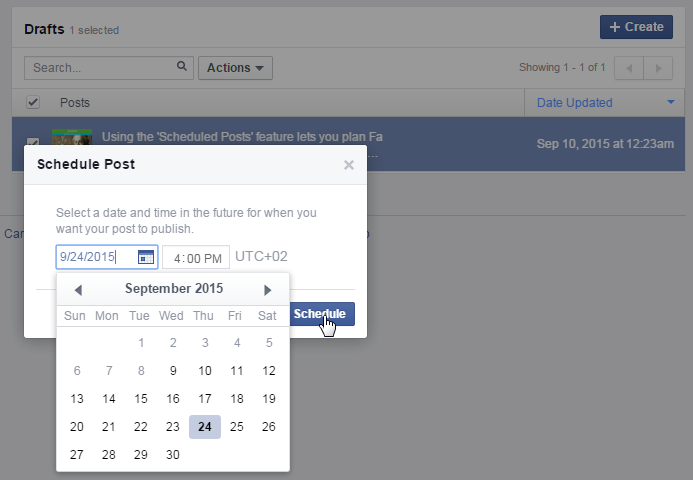 Scheduling posts on Facebook doesn’t take that much more time than posting them directly on your company’s page. Another potential life-saving benefit is to prevent major bloopers or less crucial yet embarrassing mistakes (typos, bad links, broken pictures…), simply by taking the habit of drafting and scheduling messages as opposed to posting them live. 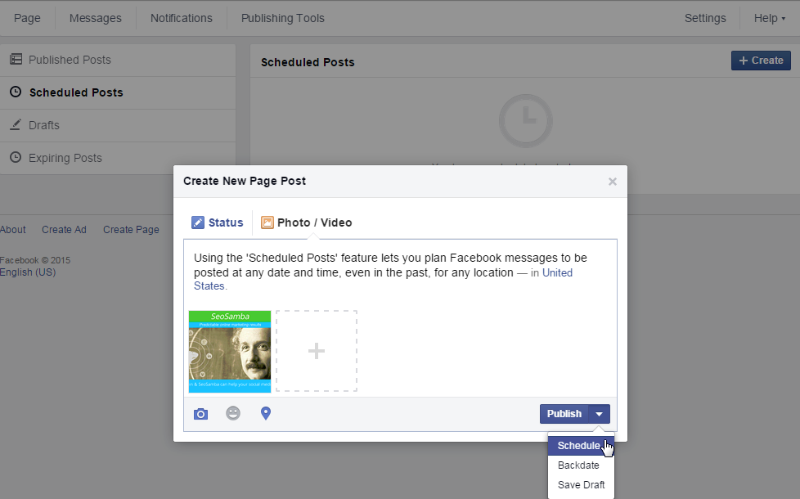 You can learn more about scheduling posts on Facebook’s help page. 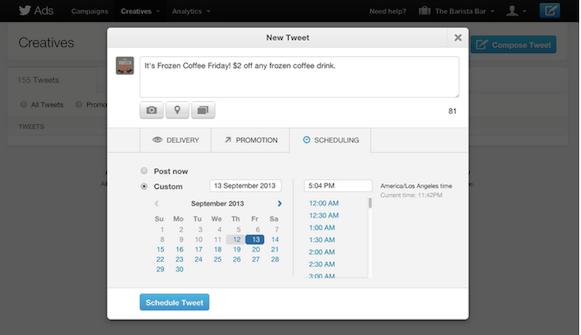 Twitter has a similar feature - although, just like Facebook, it is only available for businesses and not personal timelines - that can be used to schedule tweets. The scheduled posts can be managed through the Creatives tab - or using the Tweet composer which you’ll find at the top right of Twitter Ads - and you can learn more about it on Twitter for Business Help page. LinkedIn, on the other hand, does not currently let you schedule posts, whether for personal or company pages. There are many - mostly paid for - online services that can do that for you but you better be sure they are in line with LinkedIn’s user agreements as the network specifically prohibits to "use bots or other automated methods to (...) send or redirect messages". LinkedIn is not alone is scoffing at post-scheduling which is very unfortunate and forces social media managers to use 3rd party apps. That is the case for Instagram, Pinterest, Google+ and most other social networks. So how do you switch to time-driven posting if the social networks don’t let you do so? This is where you can separate yourself from the less-savvy hordes of competitors and reveal the true social marketing genius in you. The next step: automating social excellence? By now we understand why and how smart social media planning can give us more bang for our buck by multiplying conversion rates, just by adapting our posting habits. According to all the well-meaning social marketing gurus, in a perfect world you are supposed to post several times a day on scores on social media networks, each having its own specific requirements and best practices. But we definitely do not live in a perfect world, and in our opinion you shouldn’t have to suffer through endless hours of painful work to achieve social media greatness. We’re not exactly the only ones thinking that way, which is why many apps and software have taken on the challenge of automating social marketing to alleviate every social marketer’s excruciating pains. Unfortunately, most social networks do have preventive and even coercive measures to prevent automated scheduling and posting. So before you jump on the automated bandwagon, you might want to check twice on software and applications that claim to do all those wonderful things on your behalf. Out of the scores of web-based software that claim to do the job, we’ve tried plenty of them but remained mostly unphased about their overall efficiency and return on investment. Most focus on a single social network, and many pretend to be universal problem-solvers when they clearly are not fully satisfying. 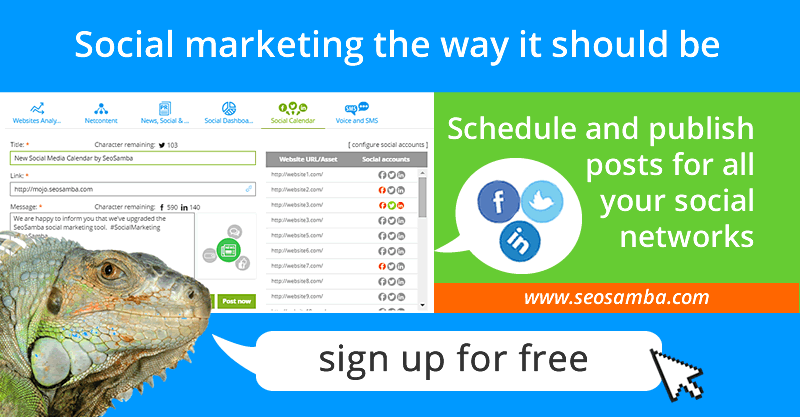 For instance, well-known marketing automation software Hootsuite recently claimed to finally allow for automated scheduled posting for LinkedIn, while in truth it merely adds it to a queue and alerts you to post manually on said scheduled time. Hootsuite will also provide you full reports on your social activities and mentions, only you will have to shell out around $50 apiece, which makes it much less interesting in terms of ROI. And don’t get us started about the whopping $49.99 (per month!) required to simply use their URL shortening tool (which by the way locks you in, as Hootsuite sales people apparently know better than integrating a great free tool such as bit.ly). Some all-in-one tools that have met some enthusiasm amongst social media managers include Buffer App, SocialOomph or SocialSprout. But whichever you may look into, you will often find small print that will shatter your dreams about acquiring a social media powerhouse for a reasonable price. Many other social marketing software do a reasonably good job for a reasonable price, except they are limited to one social platform. While it used to include Facebook profile management, a great tool like Tweetdeck is now for Twitter only, making us think that maybe their customers’ and shareholders’ interests don’t always align as they should. We could go on and on. But if you know us at SeoSamba, you also already know that if we don’t find the right tools for the job, we’ll just make it from scratch. Which is exactly what we did. In our next blog post, we will show you how SeoSamba’s social marketing software can tremendously help you boost social media engagement while saving you both time and money. In the meantime, we will let you ponder on everything we’ve discussed (it’s a lot to digest, we know, we’ve been there too!) and let you play around with the techniques and tools we’ve mentioned. Don’t worry, it will be worth the wait, and your patience will be rewarded with a straightforward complete how-to guide to nail social media greatness once for all. 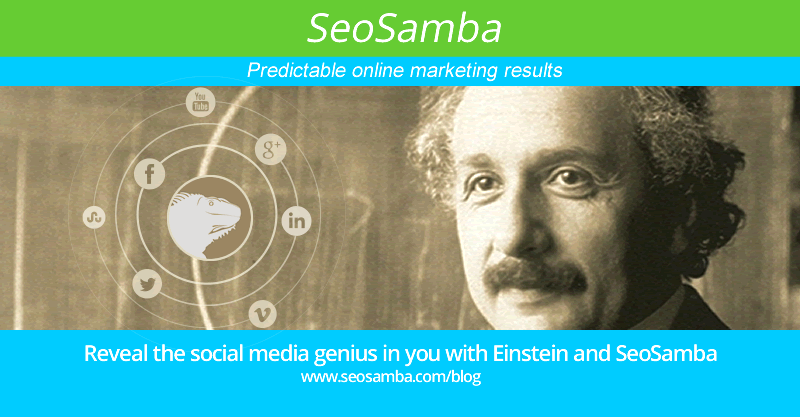 Plus, we’ll throw in a friendly time-limited special offer, so that a few weeks from now, comparing all your insufficiently-rewarded efforts thus far and what SeoSamba has in store for you, you’ll look back and agree with the great Albert Einstein: in the end, “everything is relative”.